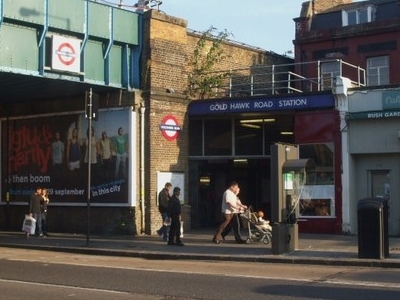 Goldhawk Road station is a London Underground station located in the London Borough of Hammersmith and Fulham, on the south side of Goldhawk Road, about 250 metres (820 ft) west of Shepherd's Bush Green. It is served by the Circle and Hammersmith & City lines in Travelcard Zone 2. Although the line here was opened in 1864 a station was not opened at this location until 1 April 1914 when Shepherd's Bush station (now Shepherd's Bush Market) was moved from its original location between Uxbridge Road and Goldhawk Road to a location on the north side of Uxbridge Road. The station currently benefits from a ticket office and two Passenger Operated Machines (or POM's). The larger POM, called a Multi Fare Machine (MFM) accepts UK Sterling notes, up to the value of £20 and gives change consisting of 10p, 50p, £1 and £2 coins. The smaller machine known as an Advance Fare Machine (AFM) does not give change and accepts overpayment up to 30p. Both machines accept most major Credit and Debit cards, however to help combat fraud, individual cards can only be used once a day. These machines are the standard London Underground installation at all LU operated stations. The station also benefits from the use of Electric Service Update Boards or ESUBS. These large screen advertise service information which is updated from the Network Operations Centre, located at London Underground's head office above St James Park Tube station. 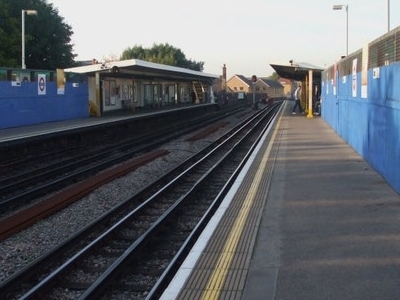 Here's the our members favorite photos of "Metro Stations near Hammersmith and Fulham". 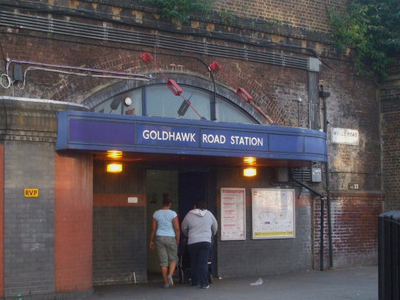 Upload your photo of Goldhawk Road Tube Station!